It’s been a busy week for organizations trying to control how people communicate, but an interesting one if you’re intrigued by issues of how social and electronic media are, or should be, used. – Athletes at the London Olympics started a Twitter campaign, using the hashtags #wedemandchange and #rule40, opposing an International Olympic Committee (IOC) policy that forbids them from Tweeting about any sponsor other than official Olympic sponsors. So, for example, if a local sponsor helped an athlete during their training, the athlete was officially prohibited from tweeting thanks – or anything else – about that sponsor during the Olympics. You can read one athlete’s frustrated account of the impact of this restriction here. – Guy Adams, a correspondent for the Independent newspaper in the UK, had his account suspended from Twitter after he Tweeted the work email address of a NBC official involved in the network’s Olympic coverage. Twitter claimed this violated the privacy provision in their terms of service. Adams pointed out that the email address was easily found on Google. Incidentally (or maybe not) NBC and Twitter have a partnership for Olympic coverage. 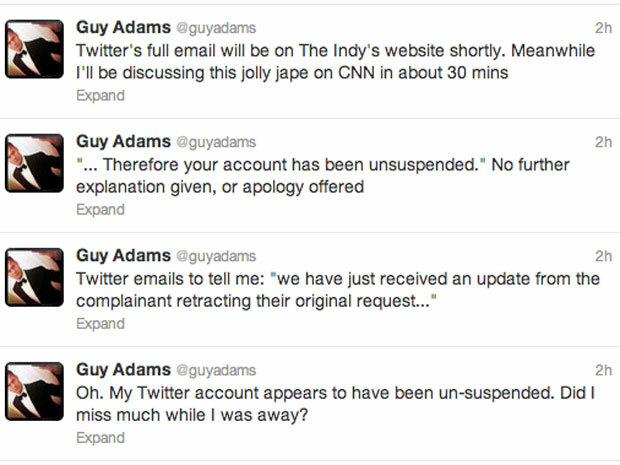 NBC and Twitter were unclear as to who complained to who about Adams’ communication, but Adams’ account was later “un-suspended”. – A British teenager sent out a Tweet threatening British diver Tom Daley and was promptly visited by local police, who arrested him. – And the Insurance Corporation of British Columbia filed a complaint with the BC Supreme Court about the union members’ new work email signatures. The members of the Union of Canadian Office and Professional Employees (COPE), who have been trying to reach a new collective agreement with ICBC for nearly two years, changed the tag line in the signatures on their ICBC accounts from “Building trust. Driving confidence” to “The B.C. government is taking $1.2 billion out of ICBC’s revenue. We work. You drive. We both deserve better.” ICBC alleges that the email signatures are the employer’s property. Organizations not knowing how to deal with electronic communications is an ongoing problem, and many organizations are struggling to determine what limits they can or should place on the use of this medium, by their own members or by those the organization interacts with. Setting limits is clearly appropriate in cases like that of the British teenager, where threats of violence are involved. However, the IOC’s heavy-handed crackdown on “unauthorized” Tweeting is problematic. Having lived through an Olympics in my own city, I can’t say I’m too surprised that the IOC is trying to quash anything it doesn’t agree with, rather than looking for a solution that would address the concerns of all the parties involved. If I hadn’t personally witnessed it, I wouldn’t have believed the degree of control that the IOC demands in exchange for the opportunity to host its event, even to the extent of insisting that its own policies override the host country’s constitution. Yesterday, a commentator on the radio said that the Olympics has stopped being about the athletes and has became all about the sponsors. But at the same time, no one watches the Olympics because they want to see the ads. The athletes are an integral part of the event, and making it difficult for them to support their training – especially for the majority who, unlike Michael Phelps, don’t have big-name sponsors – is going to backfire eventually, in public opinion if nothing else. Similarly, NBC and/or Twitter (depending on whose story you believe) cracking down on Tweeted criticism of Olympic broadcasts doesn’t work either, as NBC discovered. Social media are interactive, and organizations have to accept that if they encourage interaction in that form, not all of it is going to be positive. Perhaps it’s more constructive to engage with the criticism rather than trying to rub it out – unless the IOC’s attitude toward perceived insubordination extends to its broadcast partners as well. The ICBC case, because of its workplace context, involves some fascinating issues of employer control over employee communication. The argument that work email signatures “belong” to the company and not to the employee is particularly intriguing. Some arbitrators in BC have ruled in favour of employees who communicated union-related messages in their workplaces. Although these decisions are in a different legal context, they also dealt with the question of whether employers can limit what employees communicate in their capacity as employees, if the communication relates to employees’ other workplace role as union members. So it will be interesting to see whether the Supreme Court follows the same line of thinking as the arbitrators. I’ll post more on this case as it unfolds. UPDATE: And in yet another example of organizational control over social media, now the London Olympic Games Organizing Committee has moved to cut off a Twitter user who was posting news about which events had tickets available, using his own computer program to scan the official Olympic website for information. The Olympic ticket website will now refuse visits from anything other than web browsers. The official reason for the change was that TicketMaster, the official seller of Olympic tickets, did not want tickets falling into the hands of “touts”. But the Olympics have had problems filling seats, maybe a not-for-profit source of information about availability would be a good thing rather than a bad thing. This just seems like further evidence of the Olympics being run for the benefit of its corporate sponsors and not for anyone else.